If you're not hunting for PokéStops during your lunch break, what are you even doing with your life? In 1996, millions of children around the world sat idly on their couches, Game Boys in hand, as they attempted to aid Ash Ketchum in his quest to become a Pokémon master. Over the years, Nintendo has sold more than 270 million copies of the game, reviving its relevancy every few years with a new movie or cartoon. But despite the widespread popularity of Pokémon, few could have guessed that ten years later, those same children would be prancing around midtown Manhattan as adults, holding out their smartphones in the hopes of capturing a Voltorb in Maialino on Lexington Avenue, or a Zubat at Le Bernardin on 51st Street. But alas, here we are. Pokémon GO is officially the latest obsession of America’s overgrown kids, and in a few short days the app has almost surpassed both Twitter and Tinder in daily active users. The “augmented reality” game takes over a player’s GPS and camera to turn local hot spots into PokéStops and “gyms”—areas where users can find Pokémon milling about and battling one another. Since New Yorkers naturally gravitate toward the city’s restaurants and bars, eateries have quickly become overrun with Pokémon waiting to be captured in recent days. According to Mic, certain restaurants throughout the country have even seen their business increasing because of the game, and have begun purchasing "Lure Modules"—items that increase the number of Pokémon at a location for half an hour—in the hopes of driving foot traffic. Still, hunting for fictional creatures in a big city can be a daunting task. An aspiring Pokémon master must be aware of his or her surroundings at all times, careful not to stumble across a dead body, or, you know, get robbed at gunpoint. It’s also important to avoid Dairy Queens and steer clear of 9/11 memorials. But if you can get past the dangers and pitfalls of the game, New York can be a cornucopia of PokéStops. From Pidgeys in line at Carnegie Deli, to Abras waiting outside Guy’s American Kitchen & Bar, players can find a wide-variety of Pokémon hiding around Manhattan—especially in Midtown during the lunch rush. During one short outing, we managed to raise three levels, join a new team (shout out to #TeamMystic), win two medals, and get a few steps closer to becoming the ultimate Pokémon masters. Here, as a public service, is a guide to capturing the best Pokémon at some of Midtown’s most recognizable restaurants, eateries, and food stands. Though Eric Ripert would likely be horrified to hear that "a small, quadruped rodent-like" creature was hanging out by his Michelin-starred restaurant, we found a Nidoran in the middle of the sidewalk on West 51st Street. There was also the water-type Pokémon Seel close by, likely because of Le Bernardin's extensive seafood menu. While rumors of another Chipotle E. coli outbreak in New York were making their rounds online this week, Shake Shack may soon find itself in the middle of a health scare, with gaseous, Poison-type Pokémon Koffing monopolizing a two-block radius around the chain's 8th Avenue location. Though a number of Voltorbs and Magnemites could be seen floating around Carnegie Deli, Pidgey, the "plump bodied avian Pokémon​," seemed especially excited about getting some pastrami on rye. Seel seemed pumped about getting some Chaco Tacos from Mr. Softee, and not the least bit scared over the brewing turf war with New York Ice Cream. A number of other water-type Pokémon were also in attendance in front of the fountain on Sixth Avenue. We were able to find a Pollywhirl, a Squirtle, and a Krabby nearby as well. Meowth—frequent cohort​ of Team Rocket—just wanted a few waffle fries, but seemed to feel some risidual guilt over Chick-fil-A's questionable views on gay marriage and LGBT rights. While Zubats are easy Pokémon to catch—and can be found almost anywhere in the five boroughs—finding one waiting in the exceptionally long line at the Halal Guys cart during lunchtime almost takes the fun out of it. Kabutos are rather rare in Midtown, but we managed to catch one placing an order at Magnolia. According to Bulbapedia, Kabutos have been extinct for 300 years and "the structure of its body is almost entirely unknown​." Still, despite the mystery that surrounds it, Kabuto kind of looks like a muffin top, so a bakery made sense. Abra, a Psychic-type Pokémon, can sense danger by reading minds. With all its special powers, we have no idea why Abra headed to Flavortown, one of the most dangerous locations in all of the five boroughs. 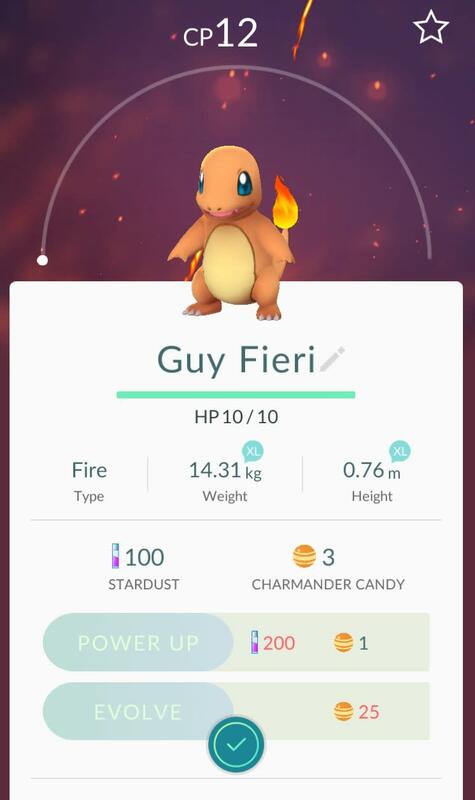 Guy Fieri—bleach blond, and often donning an assortment of flame-licked clothing—seems to roll with more of the Charmander/Charmeleon/Charizard squad anyways.